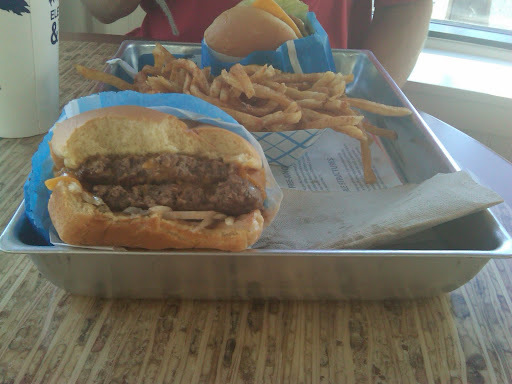 Back to Elevation Burger, the organic grass-fed burger joint. It’s a franchise, and I went to the Montclair location again with Peter-san, who just got off the plane from Tokyo. 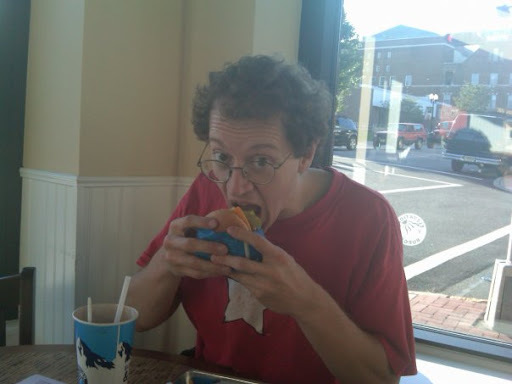 My first review a few weeks ago was a bit critical, but this time around the burger tasted a lot better. Perhaps their cooking process varies. This time it was juicier and the strong flavor of the grass-fed beef sung through the symphony of topping flavors with the voice of an angel. Peter trains at AFS with me and has had many amateur fights, and a growing boy needs his protein. So after I picked him up from the airport, we went here. He doesn’t feed his body garbage (except perhaps Men’s Toppo and Pocky) so grass-fed organic was the way to go with fast food. This time around I skipped the pickles and hot relish, keeping caramelized onions, Elevation sauce, and little else. This let the meat better speak for itself, and made for a more enjoyable burger. They also seemed a little thicker in the patty this time, and cooked more to medium than well done. It made all the difference. They don’t ask how you want them cooked, but I’d suggest asking for it to be not overcooked. Otherwise it’s like getting a well-done filet mignon. Peter liked the burger a lot, but we agreed that the fries were nothing special, really. Olive oil is tasty and healthy, but it’s not the best frying medium for potatoes. Five Guys has them beat there. Their shakes are excellent, however, if pricey. We both opted for chocolate shakes with black cherry sauce, and wow, were they good. Thick and rich with chunks of real ice cream, not the extruded soft serve you get at most fast food places. I was impressed. They also have organic cookies, but they don’t look that good- small and mushy. Burger and a shake is the way to go here, you won’t be disappointed. They also serve the Vertigo Burger, which can have as many as ten patties. My pal Mike Dross has expressed the desire to attempt a 10 Patty Vertigo in November, and I may join him. You’ll read all about it here. ← Le Samouraï – girl, gun. I won't put crap in my body, but I'll put in a sugar-laden shake sometimes. I was just capping a two-week "eat whatever" diet plan, celebrating two weeks in the sushi-and-ramen heaven that is Japan.The fries were good, but not that exciting. Just good.But the beef was very tasty, and I eat a lot of grass-feed no-antibiotic beef. In comparison, it was good stuff.The shake was really awesome. Great taste through-and-through, although I could have used a small. That's a lot of sugar in one dose for a low-carb guy like me.Next time I'll skip the shake unless it's post-workout and I'll get the burger on lettuce instead of bread. I don't think I can do a 10-patty burger. Or at least my wallet can't. But I'll come watch.